My brand new E-commerce Website will be launching at Beltane 2019 with all my new online courses, retail products and online booking Events Calendar. Please sign up to my newsletter below to be notified when it’s live. Join us for a powerfully healing and transformative 4-day Rose Retreat diving deeply through the gateway of the Dark Moon and rebirthing ourselves through the energies of the New Moon and Venus-Moon Conjunction, with elemental ceremonies and sacred pilgrimages to Avalon journeying with the ancient myths and deities of the Rose Lineage in shared Sisterhood. Registration opens in June with spaces limited to 40 sisters on a first come, first served basis. Join the Wait List to be notified first when registration opens. Join me and our international circle online each month within our sacred Rose Moon Grove. 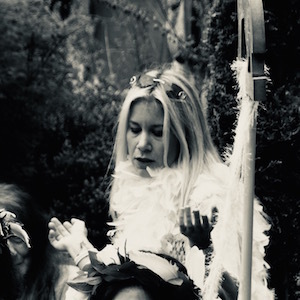 Live from The Glastonbury Gnostic Chapel on the Isle of Avalon, I will guide you in how to use the ancient Venus-Moon Cycle of the Rose Lineage for your own healing and empowerment. AND…receive New & Full Moon guided meditation videos, membership of a private Facebook Group circle, early-bird access to selected in-person events and discounts on selected online workshops & retail products. The Serpent’s Tale is an historical novel set in Italy at the time of the witch-burnings which leads the reader on an inspiring journey of spiritual transformation rooted in the mythology of the Rose Lineage and the wisdom of the Black Goddess Sophia, known as Philosophia.